You or your buyer had a radon test done and your home’s radon levels came back high. Now what? You may have had your home tested for radon before putting it on the market. Or, perhaps your buyer chose to have a radon test done during the home inspection. 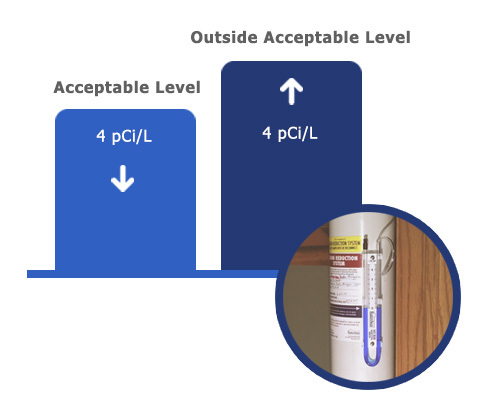 If the radon levels come back elevated, your buyer may require you to install a radon mitigation system before closing on the home or ask for a price reduction to cover the cost of installing one themselves. Most buyers will require that radon levels are below 4 pCi/L and some may even require levels below 2 pCi/L. American Radon Mitigation specializes in reducing radon levels as low as possible, often below 1 pCi/L. We perform more diagnostic testing than our competitors do and take extra steps to be able to achieve this. For this reason, we’re never the cheapest option. Reduce the price of the home so the buyer can purchase their own radon mitigation system. Most buyers actually prefer this option, as it puts them in control of the system they purchase and the company they work with. It also requires no out-of-pocket investment on your part. Pay for a radon mitigation system yourself. We recommend this option only if the buyer insists on it. When you’re selling your home, radon mitigation often comes down to two things: cost and time. You’re under pressure to find a radon mitigation contractor who will install a system at a low cost and on a tight timeline. In our experience, this often means our competitors install sub-par systems that don’t reduce radon to levels that mitigate health risks. That’s why it’s best to put the responsibility of purchasing a radon mitigation system on the buyer’s shoulders. American Radon Mitigation’s owner Jesse Green was recently a guest on Real Estate Ready 360 to discuss radon’s role within the real estate industry.